Like humans, plants need to eat in order to grow strong and healthy. However, unlike us, they don’t actually do it by wolfing down a ham sandwich. Instead, plants absorb all the nutrients and minerals necessary for their growth through their roots. Unfortunately, the soil doesn’t always naturally contain all the elements vital to sustaining healthy plant life, and must be supplemented through the use of fertilizers. Fertilizers are to plants what a protein shake is to humans; it’s seldom truly necessary in the literal sense, but it’s almost always beneficial to the growth of the shrub. A fertilizer is basically a substance, which can be organic or synthetic, and contains all the necessary nutrients for a plant to grow, as well as the elements to amend the soil, increasing both its water retention capabilities and aeration. Of all the nutrients a fertilizer will provide, the three most important macronutrients are nitrogen, phosphorus, and potassium. These three will help promote root growth, blossoming, and fruit bearing, which in turn will benefit the strength of the plant and help it produce big and juicy fruits and vegetables. Below are our top picks for fertilizers for vegetables for 2016. The Scotts Miracle-Gro Company is the biggest manufacturer of lawn and garden products in North America. It has significant present in several countries, such as the United States and Canada, and most of Europe, as well as the Asia Pacific region. Their famous brand of Miracle-Gro fertilizers are the go-to choice for the most demanding gardeners, and the quality behind each one of their products is unmistakable. The Miracle-Gro All Purpose Plant Food can be used on a wide range of plants and vegetable crops due to its carefully-balanced NPK ratio. The 24-8-16 formula ensures that your plants get enough nitrogen to sustain their tissue throughout their life. Its contents are also high in potassium, which is a vital macronutrient once your vegetable plants start bearing fruit. Urban Farm Fertilizers is an eCommerce dedicated to helping maximize their clients’ home garden production. They have a whole line of lawn and garden products, including pumps, pots, fertilizers, and other accessories for the home garden enthusiasts. 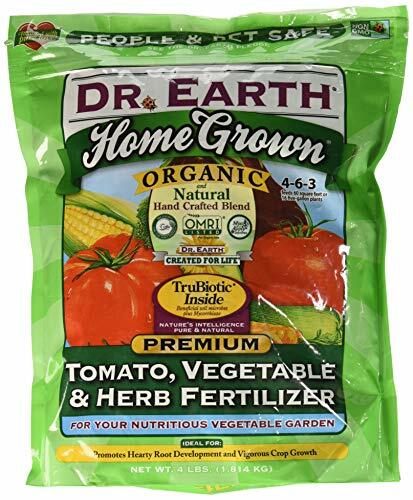 This line of specially-formulated fertilizers is made for use on all type of vegetable plants, and its carefully-balanced 4.5-2.5-6 NPK ratio ensures that all your plants receive a steady nutrition. This product, in particular, is water soluble and highly concentrated (mind the smell! 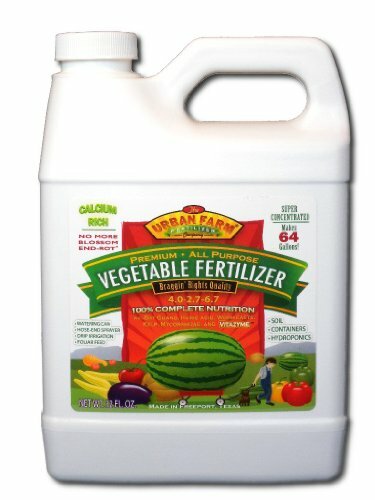 ), so a 1-quart bottle can make up to 64 gallons of fertilizer. It is made out of organic components and contains high amounts of calcium, a nutrient that is vital to prevent rotting in the tips of the blossoms. 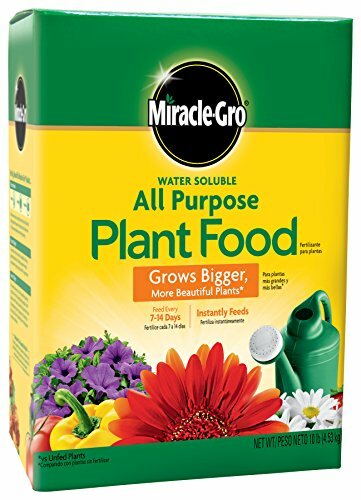 As I mentioned above, the Scotts Miracle-Gro company is the manufacturer of some of the best garden fertilizers in the market. 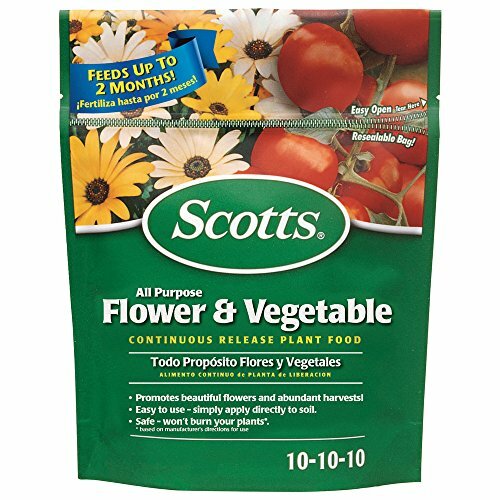 While their line of Miracle-Gro products has already captured the hearts of many gardeners, their Scotts brand of fertilizers also manage to shine in their own way. This all purpose plant food can be used both to promote the creation of beautiful flowers in flower plants and to increase the quality and quantity of your vegetable plants and their crops, respectively. Its continuous release mechanism ensures that your plants remain fertilized for up to 2 months without reapplying the product. This fertilizer is applied directly to the soil and requires no watering to start doing its job. The people of Dr. Earth are tasked with creating the highest-quality organic fertilizers in the market. Their sole mission is to promote the use of organics as a means to preserve the earth. In this sense, they are constantly innovating and researching new products to feed all types of plants, in an environmentally friendly manner. This particular product is made out of a combination of animal and plant components, including fish meal, bone meal, feather meal, kelp meal, and alfalfa meal. Along these ingredients are 7 strains of beneficial microbes that will inhabit the soil and help break down the nutrients in it to enable the plant to absorb them. As is expected from Dr. Earth products, this one is completely organic and eco-friendly. Jobe’s has been in the fertilizer business for more than 4 decades. Their sheer amount of experience, combined with their passion for creating the best products in the market have earned them a rightful spot among the top companies in the business. 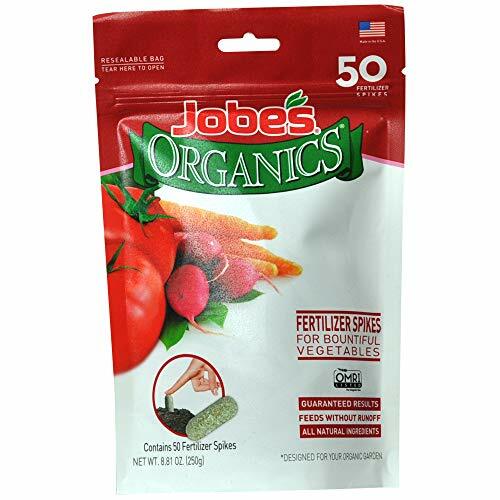 Jobe’s pioneered the spike fertilizer, which is used by driving them directly into the soil where the plant is located and letting it do its work. The slow release mechanism will allow the affected plants to keep fed for up to 2 months without replacing the product. The effect of the fertilizer will progressively create an optimal environment to sustain plant life, which will allow you to keep healthy vegetable plants even after multiple sowings. Picking the right fertilizer is more about getting to know your plant’s requirements, rather than going with the “best” garden fertilizer. Despite offering similar ingredients (NPK), each fertilizer does so in differing quantities. When it comes vegetable garden fertilizers, you might want to pick one that offers plenty of nitrogen to promote healthy plant growth. Potassium is also very important for vegetable plants, as their requirements for this nutrient increase as soon as they start bearing fruit.